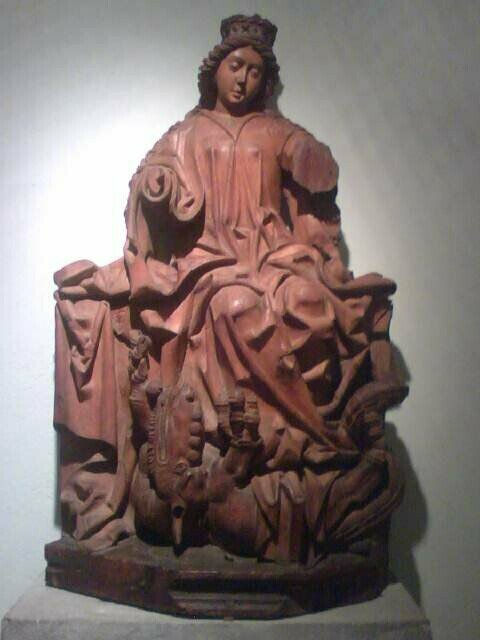 From the Cloisters, statue of Saint Margaret of Antioch: Like most of the early Christian virgin martyrs, she was secretly faithful and it was only when a Roman bigwig wanted to marry her that she ran into trouble because she refused him, and in public, too. Roman bigwigs hate that. She was tormented by a demon, but she got the better of him, because when he turned into a dragon and swallowed her, she made the sign of the cross and presto! She popped out of a dragon’s belly and thus became the patron saint of childbirth. The demon who was left behind she threw down and held with her foot until he cried “uncle!” and gave away all his secrets. Her suitor tortured her but Margaret refused to give in. Finally he had her beheaded and she died, though she managed to convert a lot of people in the process. Saints and zombies — beheading will do them both in. You can always tell the difference, though: saints always smell good. Medieval texts always describe them as being accompanied by a wonderful scent, flowers and spices. Information to file away: you’re welcome. Previous Post BitchBuzz: Hate Valentine’s Day? Blame Chaucer! Just putting my education to good use for the general public! Indeed! In fact by her example she converted her executioner who then refused to behead her, which irritated her to no end because of course she could not get her heavenly reward until she got the chop. We used this to comic effect in my play about the Absolutely Fabulous Life of Saint Margaret as Tolde to Marie de Brooklyn, which incidentally started Miss Wendy as her best friend Patsy.Cable is out so I have no Internet! Oh and St Cecilia had her head *almost* cut off and spent three days before she expired converting people with her eloquence and bleeding milk from the wound. The wacky world of saints!